They say you can’t compare apples to oranges, but we ask why not? They have enough similarities to make them comparable, even if they have plenty of differences too. Comparing the 2019 Mazda3 to the 2019 Ford Fiesta is a bit like comparing apples to oranges. They seem wildly different, and we can assure you that they are, but there is always some value in a comparison between two sedans, just like the comparison of two fruit. Both vehicles fuel economy ratings average out to 30 mpg for the combined rating. The 2019 Mazda3 has a slightly larger fuel tank capacity at 13.2 gallons compared to 12.4 gallons. It might not be much, but that extra gallon of capacity can get you 30 more miles towards your next gas station stop. The point of comparing apples to oranges is not to find which is objectively better, but to find which is subjectively better, and the same can be said for this comparison. We can’t tell you what is better, but we can tell you which we prefer: the 2019 Mazda3. In the chart above you can see that the 2019 Mazda3 has a larger engine that provides more power at lower rpm. The matter of opinion is whether you prefer a vehicle with more power or not. 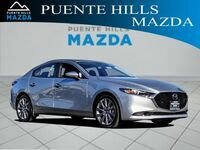 What is less a matter of opinion and more a matter of fact is that the 2019 Mazda3 Sedan offers standard features that are not available on the 2019 Ford Fiesta S Sedan. For example, the 2019 Mazda3 has standard cruise control, an outside temperature gauge, automatic headlights, alloy wheels, and remote releases for the tailgate and fuel doors. None of these features are available on the 2019 Ford Fiesta S. They are both five passenger vehicles with four doors, but the 2019 Mazda3 offers more passenger volume and cargo volume inside than the 2019 Ford Fiesta. 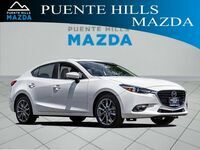 If your tastes have been set on the 2019 Mazda3, come into Puente Hills Mazda to view our Mazda3 inventory. Interested in a Mazda Mazda3 4-Door?